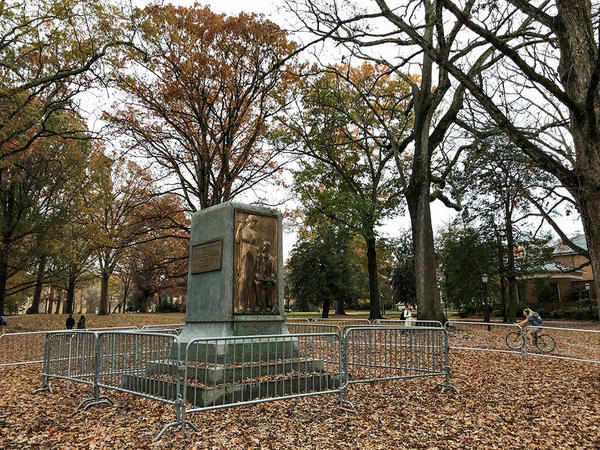 A photo take on Jan. 15, 2019 shows the site of the former Silent Sam statue and pedestal. University officials removed the pedestal last night. 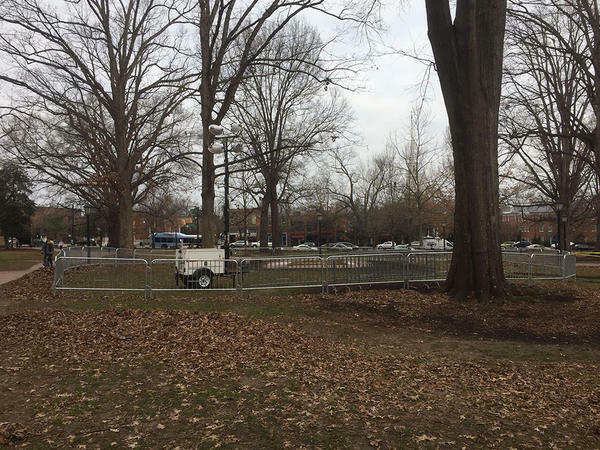 A photo take on December 2, 2018 shows barricades surrounding the pedestal where the Silent Sam statue once stood. The move came less than 24 hours after Folt announced her resignation and a plan to remove the last remnants of a Confederate statue known as "Silent Sam" from the Chapel Hill campus. The university announced at 1 a.m. that the removal had begun, and by 2:40 it was all over. A work crew with a large truck, a forklift and floodlights took the last piece of the base from the main quad, leading to cheers by a crowd that had gathered to watch. In a conference call with reporters Tuesday, Folt said her resignation is not connected to her decision to remove the remnants of the monument from campus. She said she did not want her job status to be part of her decision about the monument. Folt said she believed it was time for her to move on after checking off a list of accomplishments like making fundraising goals and leading the school through an academic scandal. Crews removed the base of the statue overnight. Board of Governors Chair Harry Smith said the move to end Folt's time at UNC early is not meant to punish the chancellor. "We just felt strongly that based on where we're at here, in order to move the institution forward that we needed to make a change," Smith said. "That's not punitive in any way, shape form or fashion. She resigned and we accepted it. We just felt it was better to compress the timeline and work more toward a healing process." The statue itself has been in storage since it was pulled down last August by protesters who consider it a racist symbol. Citing safety concerns, Folt said the massive pedestal and bronze memorial plaques also will be stored while their fate is decided. "The presence of the remaining parts of the monument on campus poses a continuing threat both to the personal safety and well-being of our community and to our ability to provide a stable, productive educational environment," Folt said. In a statement sent after midnight, Gov. Roy Cooper said he appreciates Folt's "actions to keep students and the public safe." "North Carolina is welcoming to all, and our public university should reflect that," Cooper said. Folt's move drew an angry initial response from Smith, chairman of the board that oversees the state's public universities. The board had given itself until mid-March to come up with a plan for the statue, and Smith said that timeline hasn't changed. As the public face of the university, Folt had been criticized both by those who wanted the statue gone for good, and those who said state law required it to be restored to where it had stood in McCorkle Place since 1913. Folt's announcement also comes shortly after the departure of the president of the statewide university system, Margaret Spellings, who had also frequently drawn protesters' barbs.